Commerce marketing platform Bronto Software has two recent app releases you might have missed, but are worth a closer look: Browse Recovery and Predictor these can help to target your email marketing messages to almost buyers and give product recommendations based on inventory and product information. 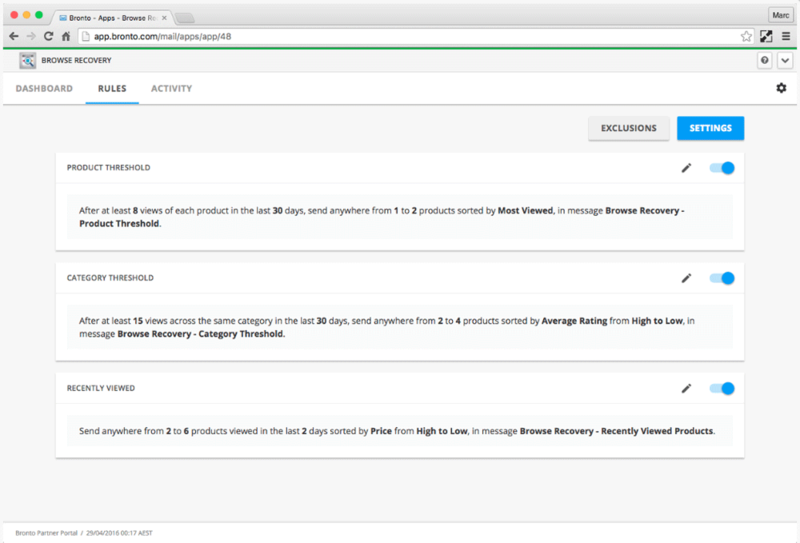 With the Bronto Browse Recovery and Predictor apps, marketers can pull their catalogue of product data into the Bronto marketing platform and automatically access it when building targeted email and SMS messages. The new apps track shoppers’ online activity, like browsing behavior and purchases. This data is then used to create segments and give product recommendations. 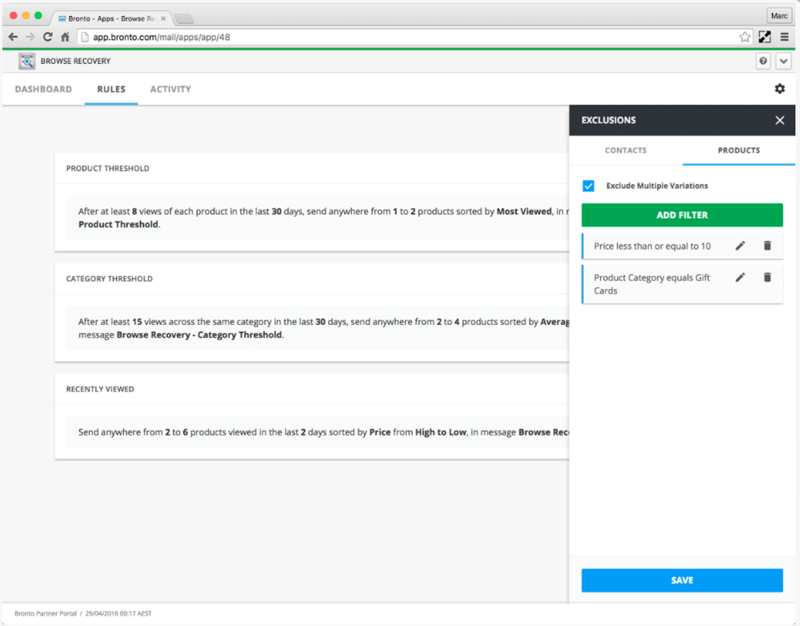 Predictor allows commerce marketers to create targeted product recommendations and show these to specific segments of subscribers using product data stored in or synchronized to the Bronto marketing platform. Below you see the predictor configuration window. A marketer can add and modify the criteria and create his own recommendations. 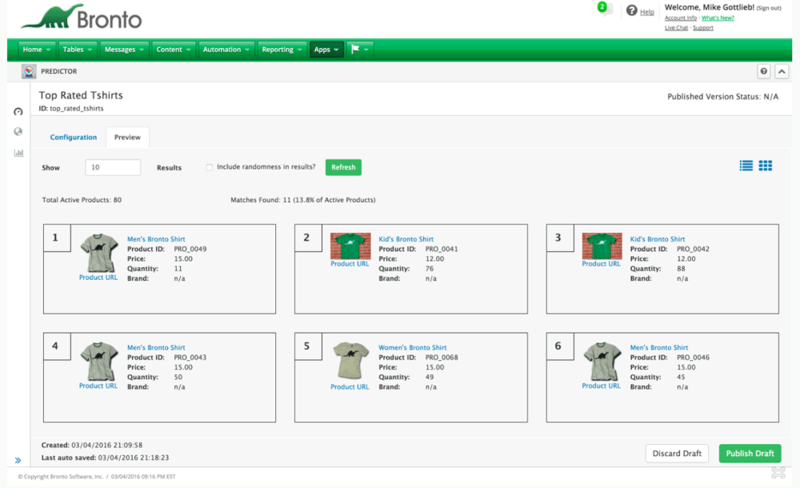 These can use all the product data available, like for instance user ratings, pricing or stock levels. The data can be used to make the selections but also to prioritize them. Next is the product recommendations preview tab. Here you can check if the results of your newly created recommendation rules are as expected, it shows the the products that would end up being recommended. Below is the dashboard view with the different sets of predictor configurations. They can be turned on and off, as well as copied and edited. A copy would be used to for instance make a variation of the recommendation. Here we see the browse recovery settings. There are several settings to configure and refine, both on when to trigger an event as well as the messaging ittself and sorting of shown products. On editing the settings, you can change sending and product field configurations. Next up, you might want to exclude certain products or receipients to recieve these recommendations, the example shows low priced items and a specific set of “gift cards” to exclude. Here is the statistics dashboard that shows the preformance of the recovery programs, including revenue if you have set that connection up. The Browse Recovery app allows email marketers to zoom in on the shoppers who are in the browse-to-buy mindset and allows you to target this hot segment. Bronto also debuted their Magento 2 Connector for the new version of the ecommerce platform. Bronto Software’s Magento 2 Connector has been verified after passing Magento’s Extension Quality Program in may of this year. With the Magento 2 Connector, Magento users can import past-purchase information, including full order history and product details from the Magento platform into the Bronto Marketing Platform (BMP). 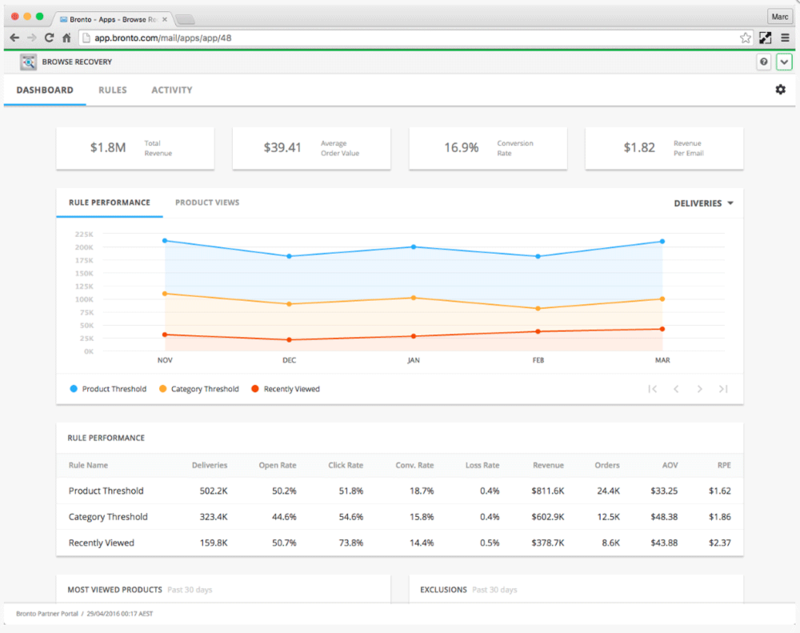 According to Bronto, commerce marketers can set this up without any IT resources. 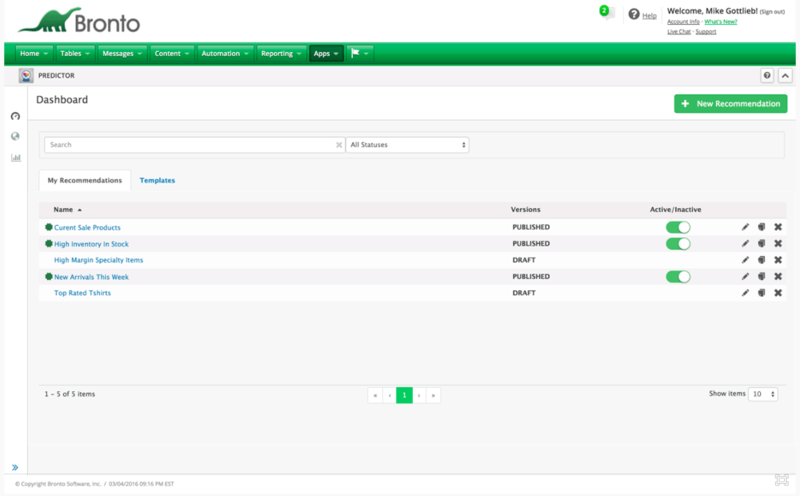 Alternatively, the Bronto implementation services team can handle the integration process for customers. That includes set-up, staging, training, production and closeout. The Magento 2 Connector is available through the Bronto AppCenter. 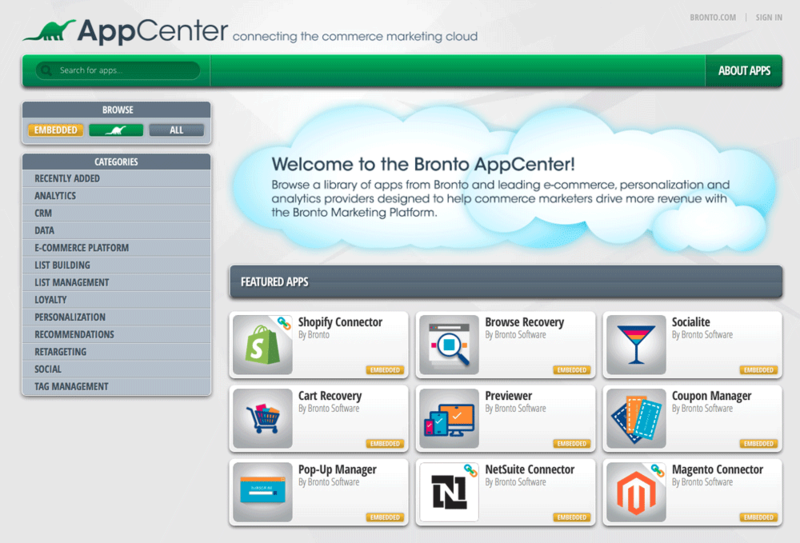 This is where all Bronto additional apps and extensions can be found. Order Import with Conversion Tracking – Import past-purchase information from Magento, including full order history and product details to create more targeted and personalized campaigns. Coupon Manager – Integrate with Bronto’s Coupon Manager app to distribute individual coupon codes and track redemption metrics. 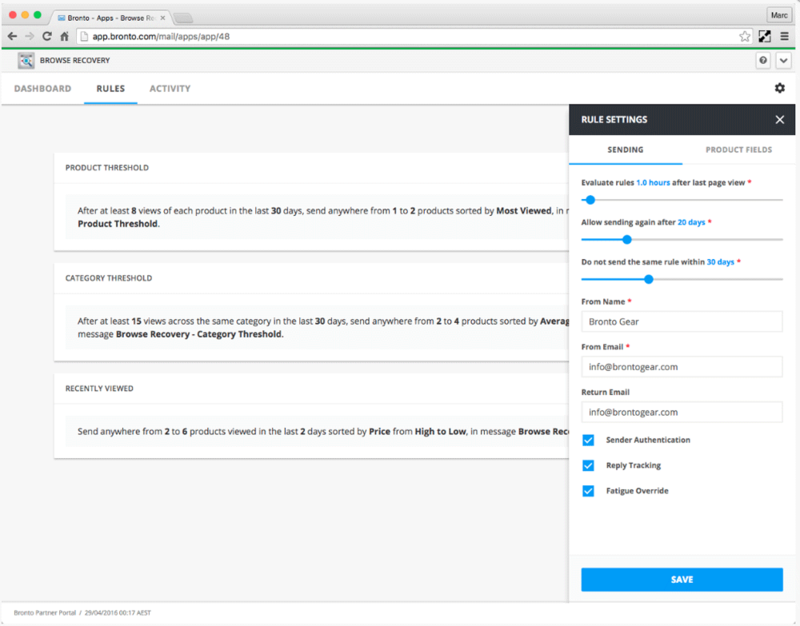 Pop-Up Manager – Integrate with Bronto’s Pop-Up Manager app to manage multiple versions of pop-up sign-ups, perform A/B testing and create a appropriate look and feel through a visual editor. Cart Recovery – Target cart abandoners with triggered, customized messages through the integration with Bronto’s Cart Recovery app. 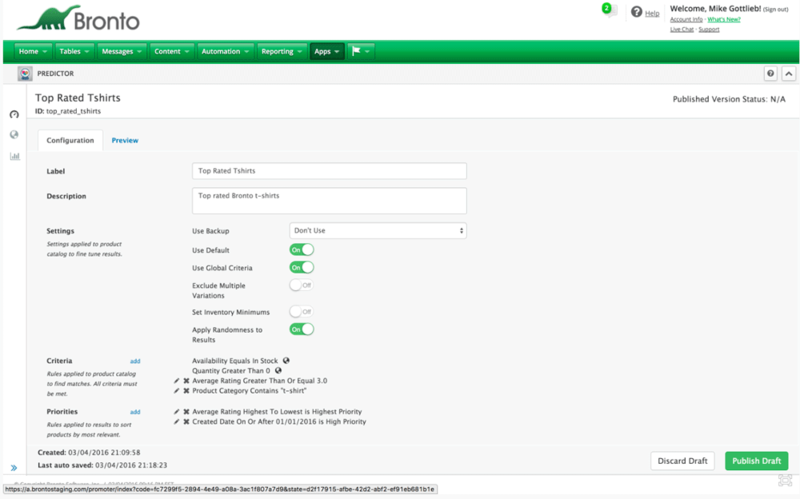 App Interface – Configure the Magento 2 Connector from within the Bronto Marketing Platform. No need to toggle back and forth between Bronto and Magento.